To understand how Allan and Kemmer deal with the question of polysemy, we need to move to a more theoretical level. We need to discuss semantics: how languages mean, for one. And then also, how humans learn and internalize usages and meanings. What is the process by which we learn new words, constructions, & grammatical forms? In Cognitive linguistics, much of this process is conceived around prototype theory. In many ways, prototype semantics finds its roots in Wittgenstein‘s work, in particular, his frustration with the traditional concept of categorization. When we learn a new word, our minds work to relate it to an existing cognitive structure. In terms of separate lexemes, we relate a word to other words that we would categorize together. Depending on its relationship to other words and what we could loosely term defining or essential features, our minds mark the word as either a good representative of the category or a poor one. It is striking that while languages show vast differences in the number of colour terms they have, there is incredible agreement on what colours are considered good representatives of the given term. The Southern African language Tsonga has seven basic colour terms (with rough English equivalents). Much of what follows is adapted & summarized from Taylor (2003), with reference to a few other sources. Taylor comments, “We find here, as in Tsonga, a rather restricted range of terms for the hue dimension. On the other hand, Latin makes a distinction, lacking in English, between blacks and whites of high and low luminosity” (4). The traditional conclusion taken from such information is that colour terms are completely arbitrary. And given what we’ve seen thus far, it’s not a terribly surprising conclusion. But it’s a premature conclusion. There’s more to the story here. In 1969, two anthropologists did a groundbreaking study of colour terms in ninety-eight languages. Their conclusion was that, “although different languages encode in their vocabularies different numbers of basic color categories, a total universal inventory of exactly eleven basic color categories exist from which the eleven or fewer basic color terms of any language are always drawn” (Berlin and Kay 1969: 2). Basic colours are those that are not morphologically complex (e.g. blue-ish) or subsumed under other colours (e.g. crimson is a kind of red) and used frequently (e.g. puce maybe morphologically simple and not subsumed under another colour, but it is incredibly obscure). In addition to this claim about basic colours, Berlin and Kay demonstrate that when two different people from different language backgrounds are given a colour chart and asked to divide up the visible spectrum on the basis of the colour terms in their languages, we’ll have as large of a variety of divisions as there are colour systems in language. However, when those same speakers are asked to select good representatives for the basic colour terms of their language, the vast majority of that variability fades away. Taylor explains the situation rather succinctly, “Although the range of colours that are designated by red (or its equivalent in other languages) might vary from person to person, there is a remarkable unanimity on what constitutes a ‘good red’ (9). Just a few years after Berlin & Kay’s studies, Eleanor Rosch built on their work, elaborating on it. She expanded on their work and extended it to other categories. For colour terms, Rosch proposed that they develop “a denotational range, not through the setting of category boundaries, but by generalization from focal (i.e. prototypical) exemplars” (Taylor 45). Significantly, Rosch’s continuing research demonstrated similar prototype phenomena in other categories such as FURNITURE and BIRD. The latter is probably the most well known example used for illustrating prototype semantics. In North America, the robin is treated as a prototypical bird with other birds being categorized as good members of the category BIRD or poor members of the category BIRD. The penguin is not a prototypical bird. In one study Rosch had roughly 200 American university & college students rate pieces of furniture on a scale of 1-7 as being a very good example (1) to a very poor example (7). The results are shown in the table below (Taylor 46). So what does this have to do with the semantic meanings of individual morphemes: words & inflections? Well, I would suggest (as would Allan & Kemmer) that we categorize the meanings of inflectional morphemes, and the meanings of words in a similar manner. Quite simply, the work of Berlin, Kay, and Rosch has demonstrated quite clearly that this is how the human mind works when it comes to categorization. And there is plenty of other research that has taken place in cognitive science that has confirmed this fact, but what I’ve provided here is sufficient for the task at hand. When we turn to Greek, one of the best anecdotal pieces of evidence I can give is the numerous discussions of how to translate prepositions that have appeared on the B-Greek list (a few examples HERE, HERE, and HERE with its rather long thread). Here are some of my own uses of “in” just from what you’ve read so far in this post. Few are truly spatial—even though I will always conceptualize “in” as spatial. Native speakers conceive of their prepositions as spatial even when they’re not. This is an important point. When asked what a given word means or for an example of a particular category, the language user is always going to provide the prototype and never a peripheral meaning or semantic extension. Because the prototypical usage is the spatial one that’s what we think of with reference to in. But even then, prototypical in creates a schema that makes it possible to relate all the other usages of in to that basic prototype. For in, it is the container schema, where all other usages are semantic extensions from that prototype. Thus in the phrase, “vast differences in the number of colour terms”, differences are conceived by the speaker (and hearer) as being contained inside the number of colour terms. So while the spatial sense is gone, it still influences how we use use in as a preposition. And the same goes for ἐν, as Silvia Luraghi has demonstrated quite clearly in her own work. The container schema is always at work in every usage of the Greek preposition, even if its realization is somewhat different from that of the English one. And with all of that in mind, when I read questions on the B-Greek list about learning the meanings of Greek prepositions through brute memorization, I shudder. Why not just keep reading and let your brain categorize usage just like it’s designed to do? Luraghi’s depressingly expensive book On the Meaning of Prepositions and Cases: The Expression of Semantic Roles in Ancient Greek, as well as Pietro Bortone’s slightly less expensive Greek Prepositions: From Antiquity to the Present illustrate quite clearly that Greek prepositions and their meanings are motivated to reflect similar categorization phenomena as we have discussed already. There are prototypical usages of prepositions and there are less prototypical usages. Language change takes place when the native speaker’s conceptions of exactly what those prototypes are begin to clash with the prototypes of other prepositions (see Bortone 72-74 for his discussion of Prototype Theory). However, for phenomena such as lexemes (e.g. prepositions) or semantic concepts (e.g. middle voice), prototypicality has slightly different affects than it does with a broader lexical category such as FURNITURE. For such categories, the members tend to form a family with the same sort of resemblances that we find in a human family. Or, as Lewandowska-Tomaskzczyk (2007) puts it, “their semantic structure take the form of a radial set of clustered and overlapping readings.” The familial organization of these categories bring cohesiveness to the whole. And this is where we come back to Rutger Allan and Suzanne Kemmer on middle voice (we’ll be focusing on Allan). The standard view of polysemy is that it is rather unstructured and somewhat arbitrary. For many traditional scholars and all structuralist linguistics, polysemy is the major problem with middle voice. It is messy, complex and unpredictable. This apparent unpredictability is what (I believe) led to the application of the term deponency to the Ancient Greek diathesis system. It is also precisely why many scholars are uncomfortable with the list-like categorization we find in Wallace (1997). But the opposite option for describing middle voice is equally unattractive: a single broad meaning that covers all usage. Such a proposal is highly unsatisfactory. The broader a meaning gets the more it loses its explanatory value. And this is precisely why many, many scholars remain unconvinced by Stanley Porter’s claims about Tense in Greek (see my discussion HERE). This is page 119 of his book and page 96 of his dissertation available online HERE. The thickness of the border around the category marks the frequency of that particular type in Classical Greek. The frequency aligns quite nicely with the number of connections a given usages shares with other usages on the basis of shared semantic features. Both demonstrate that it is the Mental Process Middle that is the Prototype for the Category. Middle voice in Ancient Greek clearly shows familial resemblances in its various polysemous usages and these usages are united by a single broader meaning: Subject-Affectedness. Rather than viewing polysemy as one problem and over-generalization as another problem, Rutger Allan brings both together and demonstrates how middle voice forms a cohesive network. While he may not have even been aware of it, Allan has successfully demonstrated that polysemy and over-generalized meanings are only problems when treated separately. By bringing them together we can see the fuller picture of the structure of the language and also avoid both of the pitfalls described by Stanley Porter in his presentation on the SBL Panel on Middle Voice. Allan, Rutger. 2003. The Middle Voice in Ancient Greek: A Study of Polysemy. Amsterdam Studies in Classical Philology 11. Amsterdam: Brill. Berlin, Brent and Paul Kay. 1969. Basic Color Terms: Their Universality and Evolution. Berkley: University of California Press. Bortone, Pietro. 2010. Greek Prepositions: From Antiquity to the Present. Oxford: Oxford University Press, 2010. Lewandowska-Tomaskzczyk, Barabara. 2007. “Polysemy, Prototypes, and Radial Categories.” Pages 139-169 in The Oxford Handbook of Cognitive Linguistics. Ed. Dirk Geeraerts and Hubert Cuyckens. Oxford: Oxford University Press. Luraghi, Silvia. 2003. On the Meaning of Prepositions and Cases: The Expression of Semantic Roles in Ancient Greek. Studies in Language Companion Series 67. Amsterdam: John Benjamins. Rosch, E. 1973b. “On the Internal Structure of Perceptual and Semantic Categories” Pages 111-44 in Cognitive Development and the Acquisition of Language Ed. T. E. Moore. New York: Academic Press. Taylor, John. 2003. Linguistic Categorization. 3rd ed. Oxford: Oxford University Press. Wallace, Daniel B. 1997. Greek Grammar Beyond the Basics. Grand Rapids. Mich.: Zondervan. 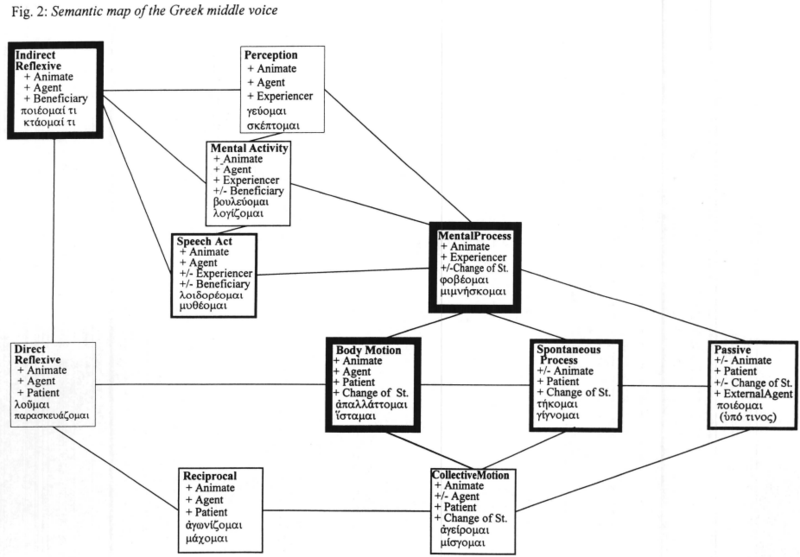 Palmer calls such a network of associated concepts a “schema.” Palmer, Toward a Theory of Cultural Linguistics, 91. Yes, Schemas are extremely important for cognitive linguistics and they’re closely related to radial networks. Some authors distinguish them and others treat them as synonyms and still others talk about one with what someone else might say is the definition of the other. All of this makes things quite confusing. Silvia Luraghi uses the term Schemas for her work on Greek prepositions. Matthew, I’ve added a bit of discussion of schemas in relation to prepositions. Mike, this is really very helpful indeed; it is no less than I had hoped when I asked for some clarification about “polysemy.” Interesting suggestion as to why the notion of “deponency” developed in the first place — people always seem to want to oversimplify what’s complex. A couple notes: (1) Have you read through Iver Larsen’s three-part discussion of ἐν on Better Bibles Blog? It’s more helpful than most of what I’ve ever read on that preposition; (2) Spelling Rutger Allan’s name has been tough for you and me both: the last syllable of the first name is spelled with an “e”, the last syllable of the second name with an “a”. I have Iver’s ἐν series bookmarked and waiting to be read, but I haven’t portioned off the time to do so just yet. Now that I’ve finally finished this post, I’ll take the time to read through it. I’ll go correct all my Rutgar/Rutger typos. Thanks for pointing that out. I gave Allan’s categories to my Greek class when teaching the middle voice, and every time there’s a new vocabulary word that’s a middle I ask them to consider which category the new middle relates to. So far, it seems to be working. Gee, I do wish I could go back and teach those Greek classes over again that I used to do before I understood what middle voice is all about, but it’s only since I retired that the great light has dawned. I am happy to be standing on the shoulders of giants. Thanks for the post, very helpful. I was just given the heads up on this whole debate and you’ve helped me understand it in half the time. anton. Thanks so much for your work on the middle voice. I especially enjoyed your wife’s chapter in the Greek Verb Revisited. I have a (simple?) question: How different is Rutger Allan’s online dissertation vs. the published version? Is it worth acquiring the published version, or is the FREE online version good enough? Thanks! Rachel and I have worked hard on voice (she’s definitely worked harder and I’ve greatly benefited!). The online dissertation is probably 95% of what’s in the book. Everything you need is definitely there. Thanks. I’m a student of Peter Gentry’s at the Southern Baptist Theological Seminary. I’m preparing for my comprehensive exams, which covers deponency and the middle voice. No rush on this, but maybe you could write a blog post at some point re: Jonathan Pennington on the middle voice. You’ve made a few comments here and there about him, but nothing sustained. He’s a professor here at Southern Seminary and has increasing influence among evangelicals. Gentry has had some influence on Pennington, so he’s been modifying his position, but I would love to hear what you think about what Pennington has written (his 2003 SBL paper, 2003 Trinity Journal article, and 2009 contribution to the Linguist as Pedagogue). I have PDF copies of all three, if you don’t have them — although I imagine you do. I don’t know if there’s a whole lot to say about Pennington. He’s basically right–maybe a little overly simplistic, but right.